This post is sponsored by StoryWorth. All opinions and experiences expressed are my own. 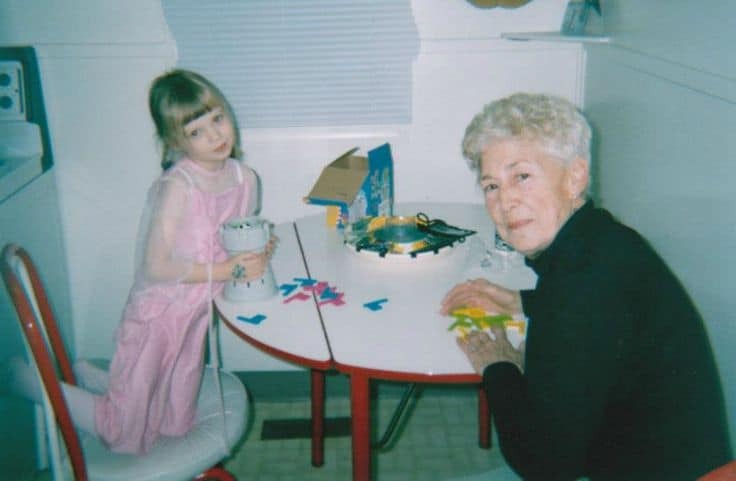 My Grandma June passed away at the end of 2012 and I miss her terribly. In fact, even thinking about her not being just a short visit or phone call away brings me to tears. Writing this post isn’t easy because of how raw my pain of losing her still feels, but I wanted to share my happy memories and show you a simple way that you can preserve your own. This picture below is how I last remember seeing my grandma. This photo was taken on her 80th birthday before she became sick. Her vibrant, fun spirit shines through. 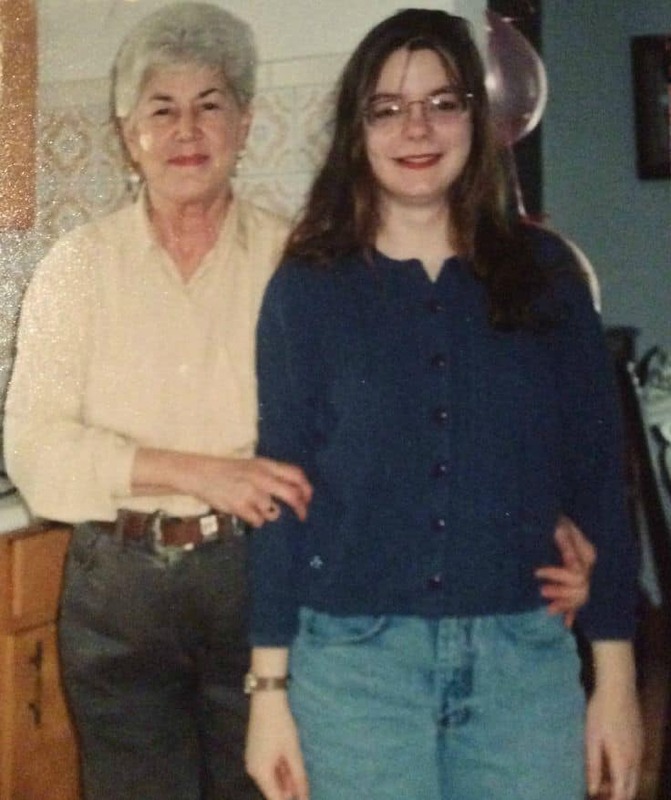 Before I get into more about how you can preserve your own special moments forever, I first wanted to share a few of my memories of my grandma. I was extremely close to Grandma June since the day I was born. Grandma always liked to tell the story how I was born on a Friday night – the same night she won the 50/50 draw at the local Lumber Kings hockey game. She said it was a lucky day when I joined this earth. 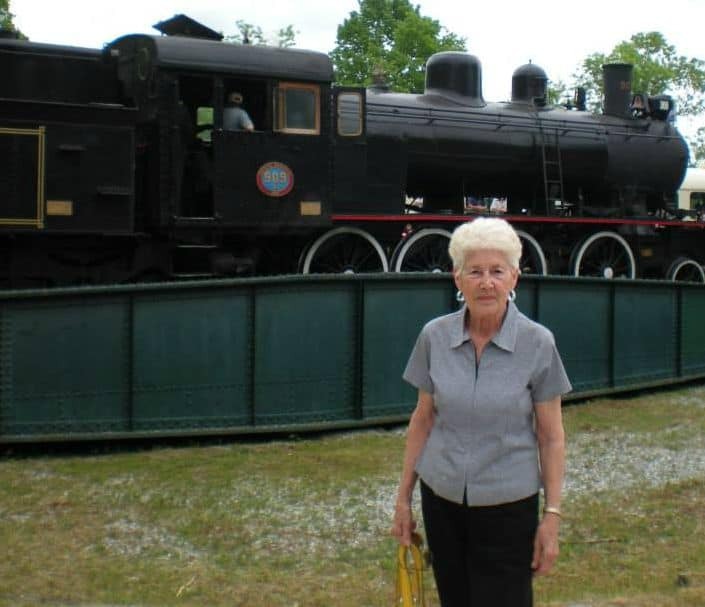 Grandma June lived in Erinsville, ON for over 20 years. She had a cute little house on a hill overlooking Beaver Lake. Her yard was huge and as I child, I enjoyed playing games, running around, exploring and just being a kid. Grandma even joined us a few times. 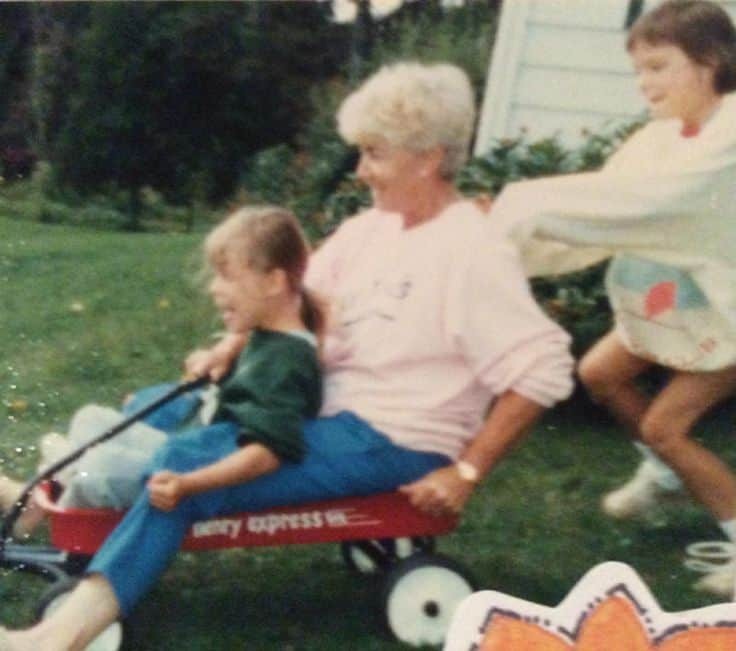 In this photo, I’m pushing Grandma June and my sister, Laura, in a wagon down the big hill. We were crazy like that. Grandma June never missed a birthday party, holiday, concert or recital. She came up to Pembroke every Boxing Day and that was when our extended family would have Christmas dinner. Grandma was the life of the party and lit up any room she was in with her bright spirit and infectious smile. Grandma loved to watch movies. Her favourite actor was John Wayne. She had all his movies on VHS. I wasn’t really interested in Westerns so she always made sure to buy movies she thought we would enjoy. She only had two channels on the TV at her house so we would pretty much exclusively watch movies. However, I do remember watching Murder She Wrote at Grandma’s place! We all enjoyed a good whodunnit. 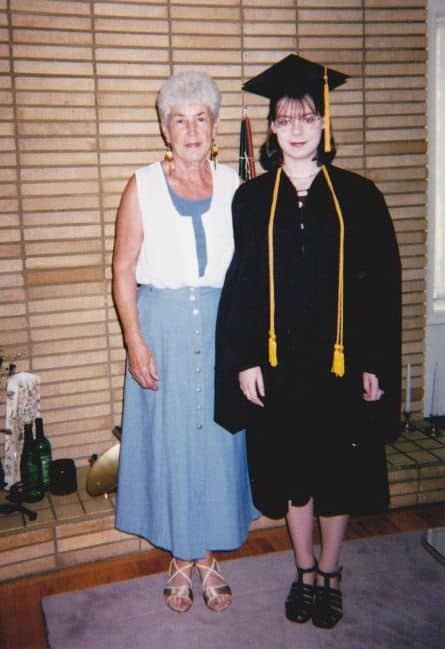 On my high school graduation, Grandma told me how proud she was of me. I won five awards at the ceremony and I could hear her cheering from the crowd. We moved to Edmonton in 2002 and my mom and Grandma June came out to visit for a week. I remember us going to the local convenience store and Grandma started up a conversation with some random person in the store. She was not shy at all. Right now, all of these memories of Grandma June are floating around in my head. It’s sad to say, but as the years pass by, they are slowly fading. It makes me sad to know that someday they may only be a small flicker. That is one big reason why I wish I had known about StoryWorth years ago. StoryWorth is a website that helps today’s families stay connected and preserve family history. It’s not a social network like Facebook or Twitter where updates are flying by so fast you can barely read them or even miss them altogether. It allows families to connect privately and in a meaningful way by sharing stories and learning more about each other. I think if Grandma June were here today that she would like StoryWorth. She loved to share her own funny and heartfelt stories about her family and her past. 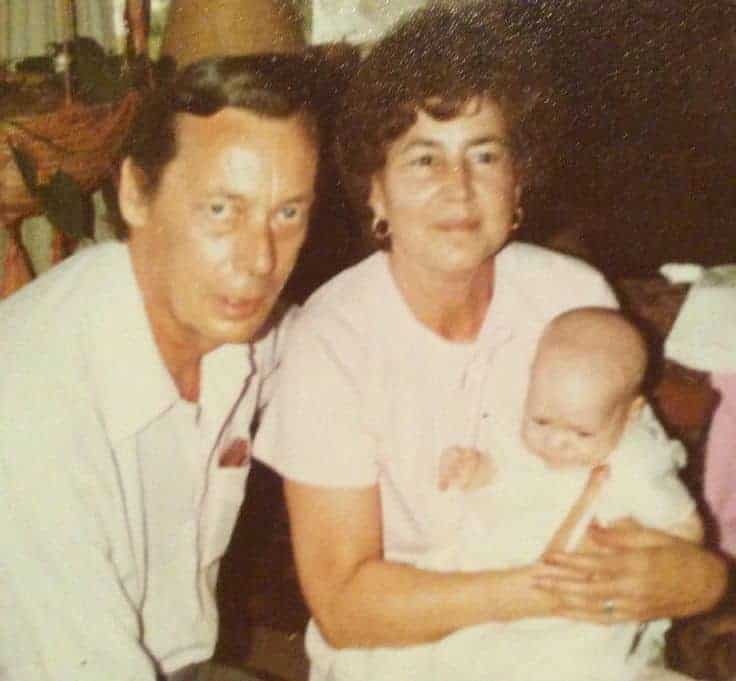 Grandma’s parents both died when she was a child and I know she would have written down all of her memories of them so we could get to know them too. Both my daughters were close with Grandma June. Bridget was only 7 when she passed away so by the time Bridget is my age, those memories will be faded. I’m using StoryWorth to record as much as I can about Grandma June both for myself and for my daughters. 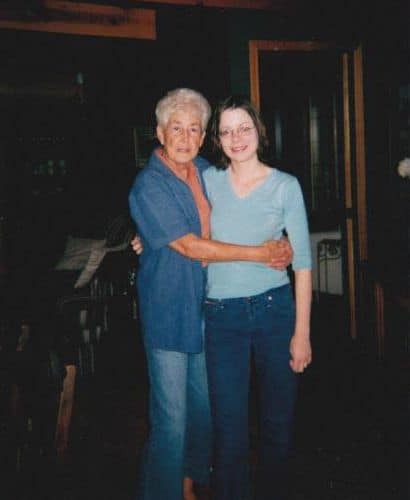 I want the memories of Grandma June to live on in my heart and in a digital format long after I’m gone. I’ve come up with a list of questions about Grandma June to help preserve her legacy. I won’t have to answer them all at once (unless I wanted to). Each week, StoryWorth emails the questions you’ve selected and you can take a few minutes to answer them. They are stored on a website for private viewing with whomever you choose. Another way to use StoryWorth is in a fun and interactive way. 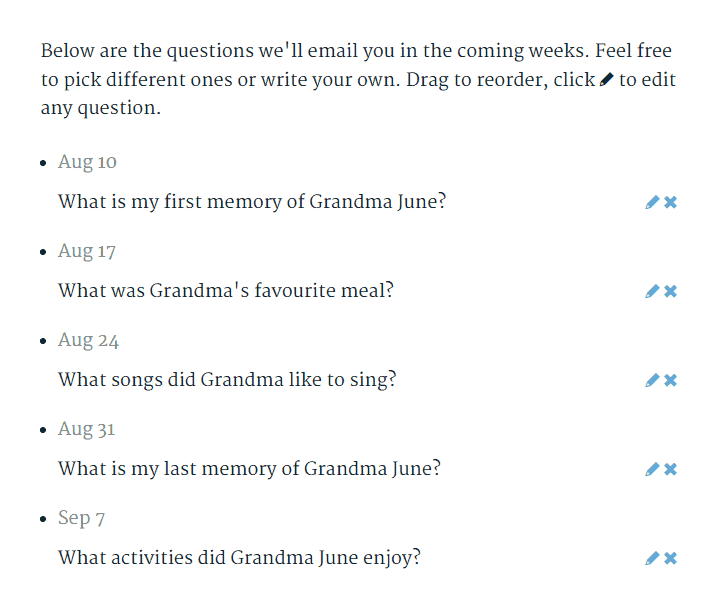 You select the questions to be answered and each week, they are emailed to your family member(s) that you select. The family member(s) answer the questions and you can read the responses on StoryWorth. I think my mom would also enjoy answering my questions about Grandma. I like that they do only one question a week so it’s not too overwhelming. I think keeping the tasks small will make people more apt to participate. Here’s a quick look at my upcoming questions and the dates they will be emailed to my mom and myself. You can try StoryWorth out for free for 30 days to see how you like it. After the free trial period is up, the cost is $6.49/month, paid yearly. You can’t put a value on memories. To me, they are priceless. I love the idea of StoryWorth and how it will allow families to connect, share and learn more about one another. Are you concerned about your memories fading over the years? Join the #Flipp4BTS Twitter Party on August 12! I think everyone is concerned about fading memories. Our brains can only hold so much, and the further away something – or someone – is, the harder it is to remember all the little things that were so great. Our family recorded my grandma with a whole lot of questions so we could see what her life was like. 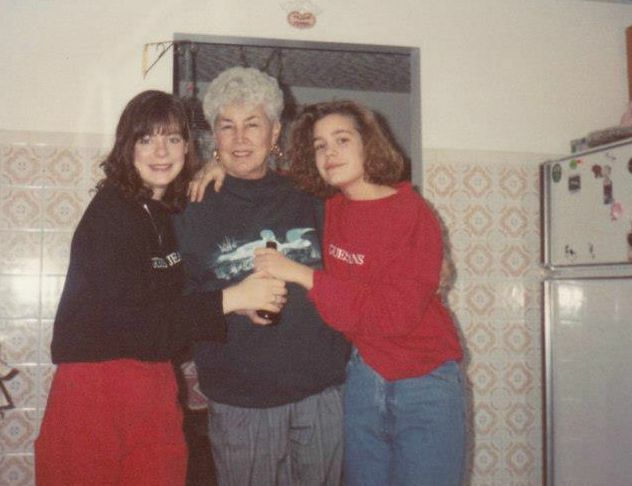 A few years after she passed away and we now have these memories to hold on to her. It is so important. It is just so heart wrenching when we lose someone as close as your grandmother was to you. This is a great way to hang on to those memories. My mom also loved John Wayne and Murder She Wrote! What a special woman! I love the idea of storyworth! Our family has been looking for a site like that to stay connected and share special memories. Thanks for sharing your memories of your Grandma June, Stacie! What a great idea. I wish all my grandparents would save all their stuff and tell their story. My Nana used to babysit me when I was younger and we would always watch Murder She Wrote together. I loved watching it with her. Thank you for sharing such great memories! That sounds like a great way to remember everything about her. Sounds like a wonderful way to remember someone. I love looking back at old photos to remember everyone by. I make sure to always take pictures so I can always remember and have great memories. It’s so sweet how close you were with her. I really like how you can keep the memories alive through StoryWorth. how cool!! I should have my girls do this with their grandparents. I definitely worry about losing memories, especially those of loved ones. This is a great way to make sure that doesn’t happen. This is such a great idea. I am always trying to make backups of all of our photos. These are great memories that you have of her. This is a great way to keep memories. I will have to try this for our family. Grandma June sounds like a great grandma! I love how your can preserve your memories, your right the older you get memories tend to fade, this is a great way to not lose them! After losing most of our pictures to a recent fire, I appreciate the value of something like this. Thanks for featuring Story Worth. I had never heard about it and know this would be a wonderful way to preserve memories.